Can you feel the ark shell burn? Photo courtesy of Michael Kanaley. Found in Chiang Rai, Thailand. In the fryer, the steaming fryer, the shrimp burns tonight….. 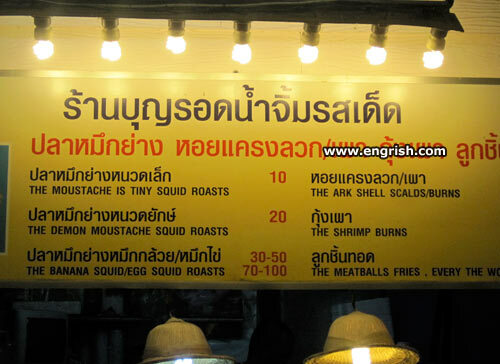 I don’t think Mario’s mustache would be made of squid roasts. I would think that vermicelli would be more appropriate. This one time I almost caught a banana squid, but it split quickly and it got away. Noah’s ark’s shell scalds/burns, which is why some sea creatures did not survive the flood. This beard is full of squid! – And a beard for my wife, please. I’ve always heard that the Ark of the Covenant would burn you if you touched it, but I never guessed it would have been found in restaurant in Thailand. In case you wanted to know why some moustaches smell funny, here is your answer. I really don’t think that the Ark of the Covenant should be touched by mortals. @J-Luke. Oh. I thought the cause was the ladies I licked. Shark is swimming along when he sees squid. The squid roast is just another little Hitler! I wouldn’t go there. Most of the food wants to either hurt me or insult my moustache! I would like one Raiders of the lost Ark combo, please. Hate it when the shrimp burns…Thank God for penicillin! Where do you wanna go to eat tonight? I dunno, what about Mustache Hut? To be served with Scottish Whisker ? This selection of food, especially the seafood is very critical and insulting to a lot of things. No matter what, all shell fish are doomed. Ark shell burn and cauldron bubble!